Driver Easy 5.0 final version is about to release. The beta versions have been released for your trial. Try the third beta version now, and you will see v5.0 has many improvements compared with previous version. The biggest improvement is that it allows you to update all drivers in one click. 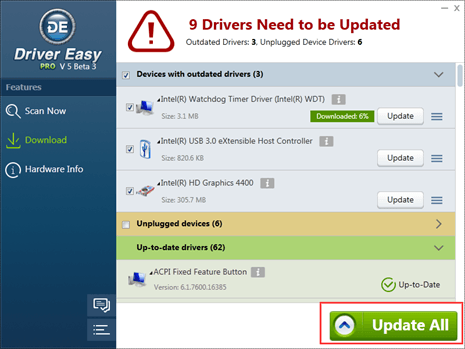 Driver Easy is always trying to make driver update as easy as possible. As you can see, the 4.x versions have easy-to-use interface, which allows you to update drivers even without any computer skills. It is easier than updating drivers manually but it is not the easiest. Driver Easy should make driver update the easiest. That’s why v5.0 came up. That’s why one-click update work after months’ development. One click update allows you to update drivers with the least steps. With this feature, you just need to click your mouse one time by clicking “Update All” button, then all new correct driver will be updated automatically. This means download and install will proceed smoothly without extra steps. With it, you can save much time in updating drivers. It is not easy to make one-click update work but it is worthwhile, as Driver Easy 5.0 will help solve driver problems in less time and steps.